Thousands marched for the third day in a row as teachers in one of the nation's largest school districts went on strike after negotiations failed. NBC's Brian Williams reports. Chicago Mayor Rahm Emanuel is ready to "finish it" already. As Chicago teachers picketed for the third day Wednesday, Emanuel said there's no reason students can't return to classrooms while union representatives and school officials hammer out the final contract issues. "There is nothing that can't be worked through while our kids stay in the classroom," Emanuel told reporters in a news conference ahead of Wednesday's City Council meeting. "My staff, as well as the Chicago Public School leadership team, is committed to working through these issues, never leaving the table to get this job done. And those issues can be negotiated simultaneously while our kids are in the classroom learning." Negotiations continued as teachers attended three rallies and continued to picket outside the board of education headquarters. The union said it submitted a new written response to CPS' latest proposal, handed down Tuesday night. 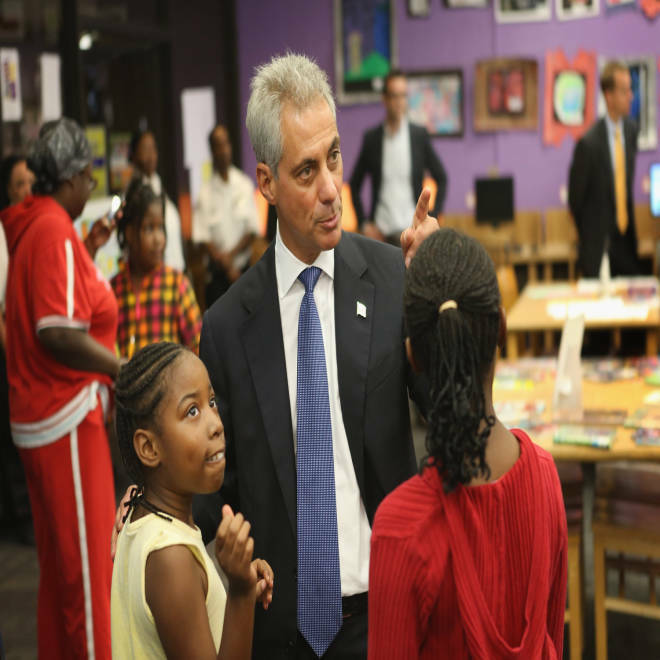 Mayor Rahm Emanuel visits Chicago Public School children at Woodson Regional Library, Sept. 10, 2012. "We've looked at their comprehensive package," CTU president Karen Lewis said before heading into negotiations. "There's some movement forward, there's some movement backward. What we'd like to do is continue to move forward." CTU vice president Jesse Sharkey said his biggest concern with the proposal was the tone. "[It] seemed to say, 'This is it, we're drawing the line in the sand, now the union's gonna have to come to us, we've done all the compromising we're going to do,' and I think that's a really harmful tone to take in a negotiation," Sharkey said. It's not clear how much longer negotiations could take. Earlier, Sharkey told reporters the school board's latest proposal isn't much different than the previous proposal and mostly just moved things around. Emanuel and school officials said only a couple key issues remain to be settled, but union representatives said there are 43 left to tackle. 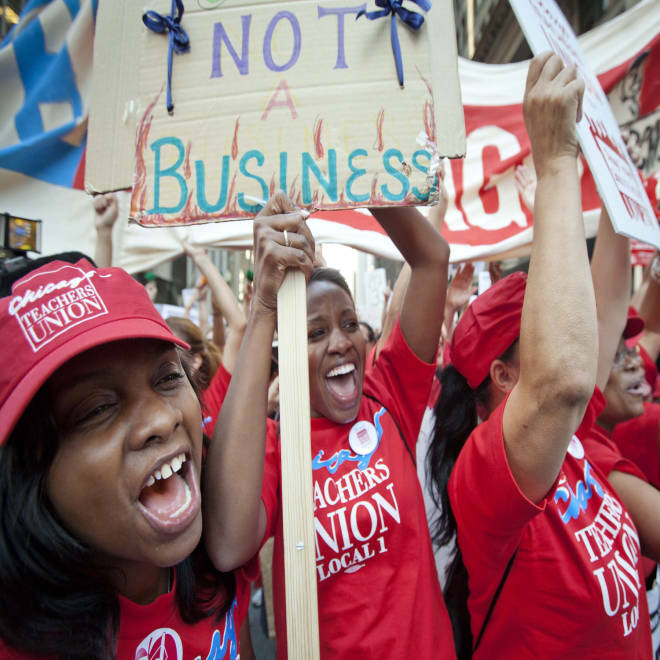 Question at heart of Chicago strike: How do you measure teacher performance? Public school teachers cheer as Chicago Teachers Union President Karen Lewis, unseen, arrives unexpectedly to address a rally of thousands of teachers outside the Chicago Board of Education district headquarters on Tuesday, Sept. 11, 2012. When asked what it hopes to accomplish Wednesday, Chicago Board of Education vice president Jesse Ruiz told NBC Chicago the group wants to make progress on remaining issues, however many there may be. "We believe we're not that far apart and should be able to wrap these things up," Ruiz said. Both sides admit some progress was made. The board agreed to the teachers' proposal on sick days, a health care rate freeze and seniority. They still haven't come to terms on a new teacher evaluation system, and Lewis said they remain "miles apart." Chicago’s school leaders are proposing that student performance on standardized tests count toward 25 percent of a teacher’s assessment, growing to 40 percent in five years. But Lewis is critical of Emanuel’s push to make great use of standardized tests in teacher reviews, calling the process flawed. Union officials say the system wouldn’t do enough to take into account outside factors such as poverty, crime and homelessness. "Evaluate us on what we do, not the lives of our children we do not control," Lewis said in announcing the strike. It was unclear what union officials proposed instead. "This is far more than a labor struggle," American Teachers Federation President Randi Weingarten said during a big rally downtown -- the second massive protest this week. "This is a struggle for the heart and the soul of public education for the kids of Chicago." In response to one potential next step being weighed by Emanuel and city leaders -- an injunction requiring teachers to get back to work -- Lewis said the mayor doesn't have the legal standing. "We have a completely legal work stoppage, we have followed every rule," she said. Meanwhile, student attendance at the 147 strike-designated schools and safe haven sites was reportedly low for the second day. At a South Side YMCA, the site saw just 35 kids Monday and Tuesday, lower than expected. Key question in Chicago strike: How do you measure a teacher?